Last weekend we drove south past Branson to the home of Big Cedar Lodge and The Wilderness Club, properties of Bass Pro Shops. A third attraction is called Top of the Rock. This was formerly the home of Graham Clark, first president of College of the Ozarks. The hilltop view of Tablerock Lake and the rolling Ozark country is unsurpassed in the region. Later the site was turned into a restaurant. Nine years ago it burned and has only recently reopened after major expansions that include a golf course (recent host to the Legends of Golf Tournament), two restaurants, a gift store, a chapel, a wine tasting bar, an indoor/outdoor pub, and more. 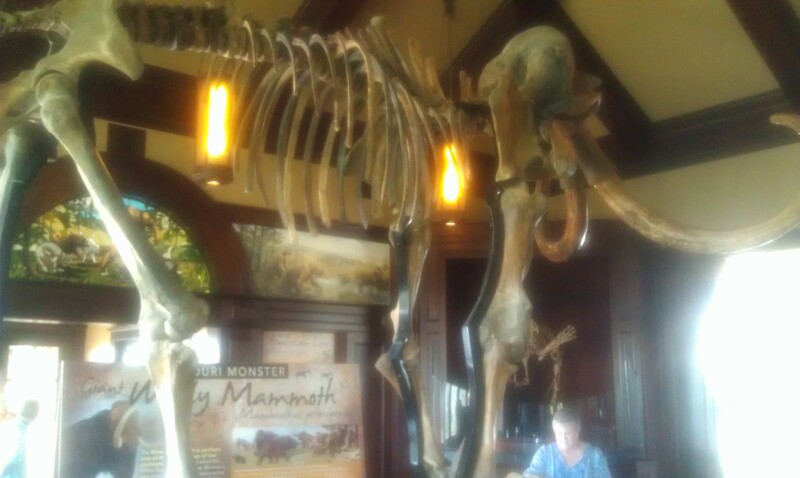 One of the things that caught my eye coming in was a display of ice age animals including the short-faced bear, American lion, and woolly mammoth. A wall reference mentions Riverbluff Cave in Springfield, home to the oldest known ice age fossils found anywhere on the North American continent (the last I knew). My book, CAVE DETECTIVES, is written about the discovery, preservation, early explorations, and mysteries uncovered in Riverbluff. 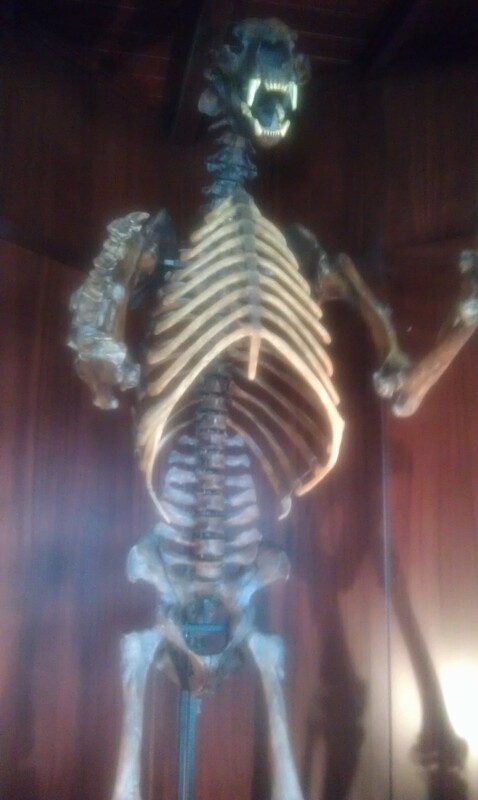 Standing there before a replica of the enormous short-face bear, mounted as though emerging from a cave, brought back memories. Here is how my book begins. 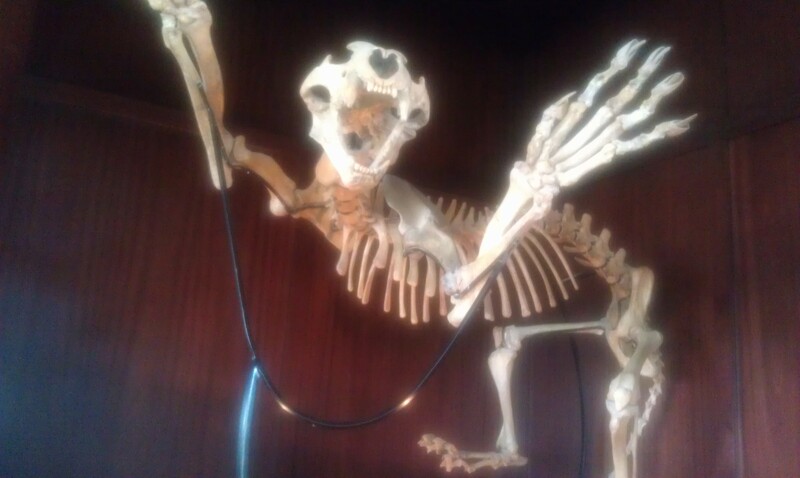 “A short-faced bear moves along a stream. He is a giant compared to any other bear that will ever live. He is mostly a carnivore, a meat eater. Whether he brings down his own prey, steals from smaller predators, or chases buzzards off a carcass, he is always hungry for meat. “The stream loops through scattered clusters of pine trees and crosses a clearing. It comes to the base of a hill and disappears into the mouth of a cave. 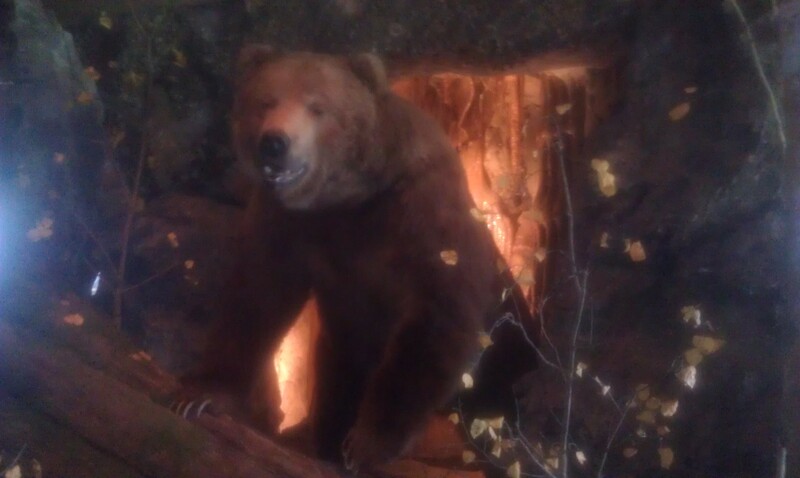 The bear knows this cave. It is cool in summer, a good place to nap through cold winters, and a safe hideaway to nurture newborn cubs. Rolling his massive head, the bear enters the cave and vanishes into the darkness. “Sometime later a band of peccaries pauses outside the cave. The peccaries are about the size of pigs; they look much like pigs, too. For a while the peccaries mill around the entrance, snorting indecisively. When the leader heads inside, the others follow. Snuffling and grunting, the peccaries jostle one another down the black tunnel. I’m glad to say that CAVE DETECTIVES has recently been made available from Chronicle Books in digital form. Anyone interested can order it online. And that’s how I spent part of my weekend!